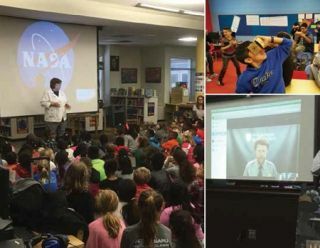 “My goal is to get our students out of the classroom any way we can, and we already do more than 100 virtual field trips a year, so when Discovery VR (discoveryvr.com) became available, we knew we’d add it to the mix,” says Dacia Jones, district science specialist and STEM educator for Durham (NC) Public Schools (DPS), where only a couple of schools are not Title I.
DPS students haven take more than 100 virtual field trips with Discovery, including exciting new virtual reality field trips. Teachers download the Discovery VR app and use it on iPads and other devices; all students have to do is manipulate the mouse on their computers to move the picture around and see things from different perspectives. Jones writes lesson plans to go with the Discovery VR clips. For “Lion Whisperer,” in which students watch a man speak to a lion, she came up with activities to do before, during, and after that are tied to the North Carolina science standards. Luckily for her, Discovery is adding new VR clips every week. When DPS first graders took a virtual field trip to the Sistine Chapel to learn about gravity, the docent described how Michelangelo lay down on his back on scaffolding and painted. Afterwards, the teacher asked the students to crawl under their desks – she had taped paper under each one. She handed out crayons and instructed them to draw. After a few minutes, everyone’s arms hurt. That led to a conversation about the effects of gravity. “Like the students who rode the roller coaster, this was so real to these students,” says Jones. For more ideas and examples of trips Jones has done, visit eieiOh! Engage! Inspire! Expect! Inform! (engageinspireexpectinform.com). Getting ready to go to the Virtual Vortex and use zSpace stations at Teasley Middle School. “When people hear the words 3D or augmented reality, they get scared because they don’t know what it is, but we built a technology-rich school two years ago and teachers love it,” says Leah Bleisath, STEM teacher at Teasley Middle School in in Canton (GA). Students visit the Virtual Vortex and learn with 13 VR stations set up as a zSpace STEM lab. Each zSpace (zspace.com) station accommodates two to three students. One student lifts, turns, or takes apart virtual holographic objects using an interactive stylus. The other students make observations and record data. All students wear custom 3D glasses to create a communal VR experience. “We use an AV rover to project a five-to seven-minute 3D video on a blank wall and students wear their 3D glasses and become immersed. If we’re teaching about blood flow, we become a blood cell. Instead of looking at a picture of a vein in a book, you are actually inside the vein,” says Bleisath. Elementary students bringing the solar system to life with AR apps like MoonWalking. By going through the process and listening to the actual recordings of Armstrong talking to the President, students experienced a deep connection. Next time around, Brown wants students to use Aurasma (aurasma.com) to create their own ARs by recording a video of themselves talking about the planet they researched. Although she’s currently using AR apps mostly for science and a little math, she started out by using them for literacy projects. She photographed students reading books by Mark Twain and created big posters of each child holding their book, and then she created Aurasmas of them talking about their books. When students scan the poster, they hear a book trailer. “AR gives us the possibilities to create awesome experiences for our students,” says Brown. High schoolers in Ossining, NY, love to go on Google Expeditions. “Once it’s rolled out fully, Google Expeditions (google.com/edu/expeditions) has the potential to completely change education,” says Adam Schoenbart, an English teacher and technology coach at Ossining High School in Ossining (NY). One day, Schoenbart hopes that students can create their own field trips by going into the community, taking 360-degree photos of the Hudson River, and sharing their own stories. “Once you add sound and narration, that’s where the real power comes in,” he says. Students embark on a virtual mission to the International Space Station (ISS) to observe Earth from space, monitor experiments, have on-orbit experiences, and see what’s it’s like to be an astronaut. Choose from a summer trip for grades 6 through 12 or a blended class for grades 4 through 12—or get a teacher license (grades 4 through 6) so that you can bring your classes on a virtual mission to the ISS to excite students about STEM. For more information, visit SpaceStationAcademy.org or or contact Kim Spangenberg at kspangenberg@thevhs.org.